This discovery couldn’t have come at a better time for me. March has been one of those months where I’ve had to juggle a million things in what seems like never enough time! It was a nice feeling to simply pick a bag (that suited my eating preferences) on the Fresh City Farms website and know there was 4 less meals I’d have to plan, prep, and cook for the week. Whether you are an omnivore, vegetarian, or pescatarian, they offer bags tailored to your eating needs. These also come in single or double meal orders (for one or two people). Each meal is cooked fresh with organic ingredients, put in a vacuum sealed jar, and delivered straight to customers in reusable bags, on ice packs. I went with an “omnivore” bag for two, which included three meals (6 jars). My meals included the Korean Beef Stir-Fry, Pesto Salmon & Quinoa, and Kung Pao Stir-Fry (tofu). 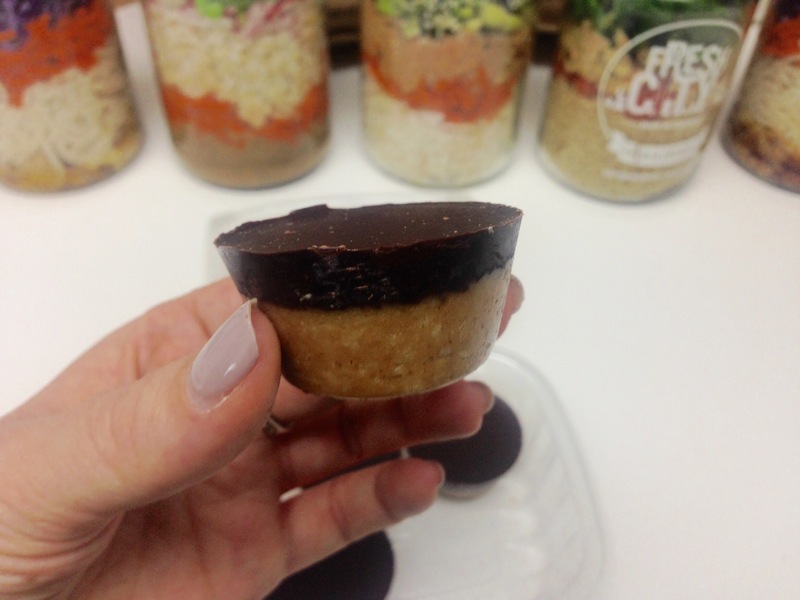 I also added a jar of the Deconstructed Salmon Roll and Dark Chocolate Peanut Butter Cups to my order because they sounded so delicious. All the meals tasted great (so yummy! ), but I personally enjoyed the Deconstructed Salmon Roll the most. This was a bowl of baked terriyaki wild salmon over long grain white rice with cucumber, carrots, green onions, edamame beans, nori, sesame seeds, and came with an Asian dressing to top it off. I brought the jar to work, microwaved, and had it for lunch. The labels suggest you can microwave or place the food in the oven to reheat, but I chose to heat the stir-fry jars in a pan on the stove. Dinner was ready in minutes! 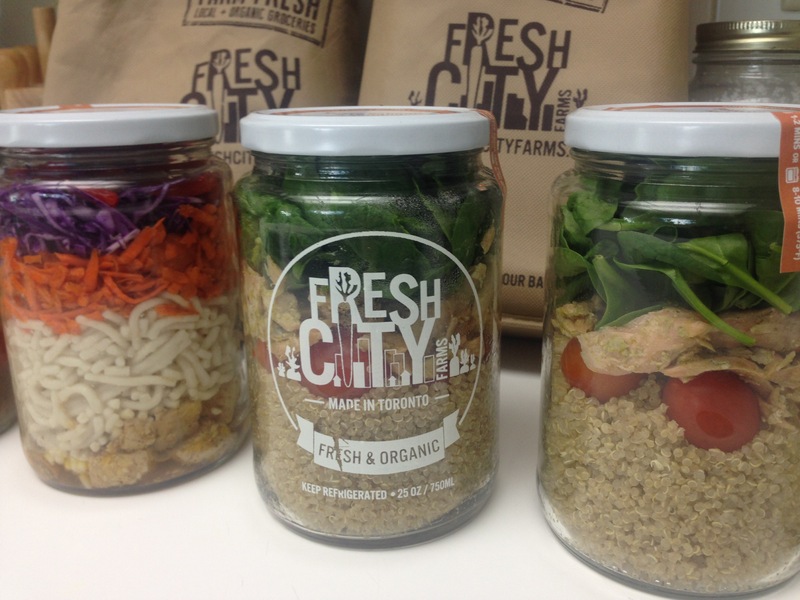 I would definitely recommend Fresh City Farms Fresh Meals to busy, health-conscious food lovers that are looking for time-saving options, quality ingredients, nutritionist approved food choices, or just a good, healthy meal. These meals make life a million times easier! I only tried a few of their options, but click here to check out their other ready-to-eat options. In my household, we find ourselves ordering food/eating out for a fast quick meal. When things get busy we just don’t have the patience or energy to prep/cook. These Fresh Meals are so handy to have for busy weeks, the cost per meal was less than what we would spend eating out or ordering delivery, AND THEY ARE HEALTHY! Often times, the quickest food choices, are not the most health-conscious options. Sign up for your first delivery here.